13 Designer Pre-Draped Sarees For Your Trousseau - All Look Stunning! This story was updated in February 2019. The wedding cards have been printed and you’re all set to go invest a whole lot of money in your pre-wedding day outfits and the trousseau!! We understand that you don’t want to have a collection of sarees you aren’t able to wrap around yourself quite perfectly. So here we’ve got a list of pre-draped sarees that we absolutely LOVE! Don A Desi Look Within A Few Minutes With Your Favourite Ready To Wear Saree! 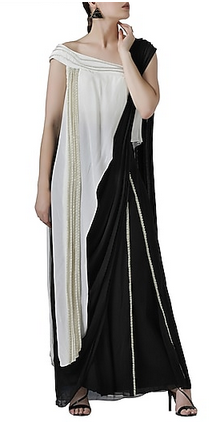 A pre draped saree is like a readymade saree or a dress where you don't have to do much. 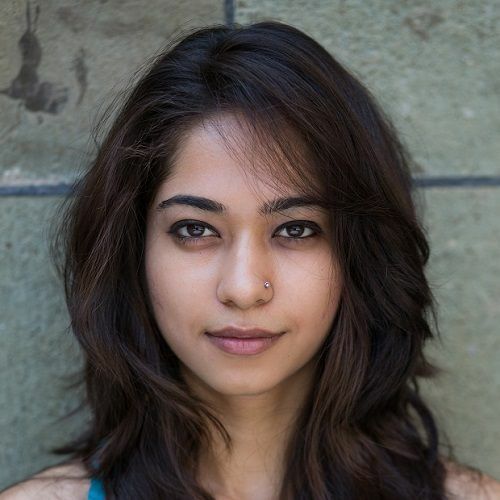 So all the super busy or super lazy ladies out there, this list is for you. 1. Classic with a twist! We love this Mandira Wirk's saree that has a beautiful blouse with motif detailing! It’s a perfect pick for a cocktail ceremony iwhere you can choose pastels to look trendy and chic. Price: Rs 48,000. Buy it here. A floral saree like this one is every girl’s dream! It is sure to make you look gorgeous and trendy. 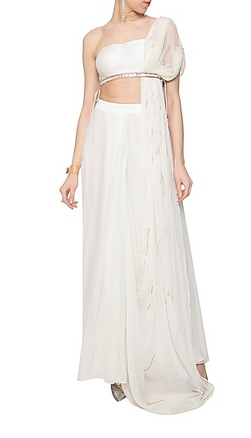 We especially love how this blouse can be used with other sarees as well! Price: Rs 68,500. Buy it here. Simple, elegant and stylish, this teal colored saree will make you look lovely at your engagement ceremony or for a daytime family function. Price: Rs 65,000. Buy it here. 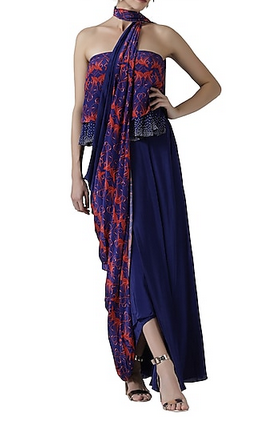 Take the elegant look to another heights by wearing this beautiful saree. Flaunt it gracefully and come back with lots of compliments. Price: Rs 22,000. Buy it here. 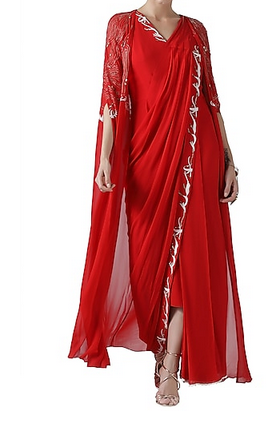 Can you imagine yourself looking drop dead gorgeous in this saree? 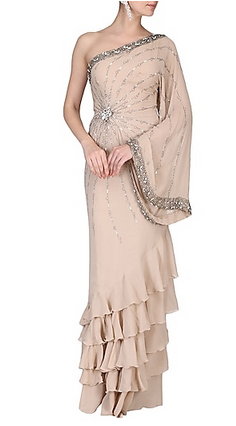 This beige draped saree is all sorts of fabulous. So go ahead and make a style statement! Price: Rs 45,000. Buy it here. Golden, embroidered and a metal belt. We have too many reasons to love this chic piece! Don’t you love it too? Price: Rs 45,000. Buy it here. 7. Show Off Your Shoulder! Navy blue never goes out of style, and neither do one-shoulder blouses. 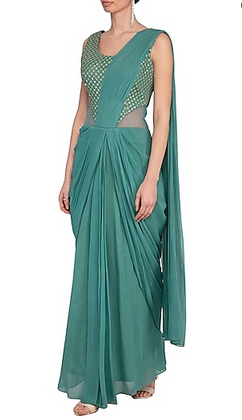 Which is why we love this drape saree! It’s totally perfect for a roka ceremony, don’t you think?. Price: Rs 24,900. Buy it here. If glitter and sparkle is what catches your eyes in an apparel then you will definitely like this one. Glam up your style by draping this gorgeous saree. Price: Rs 13,450. Buy it here. If you find wearing regular sarees for a wedding function a little boring, then you would definitely love this saree! It’ll make you look ramp ready and surely grab all the attention ;) Price: Rs 28,800. Buy it here. 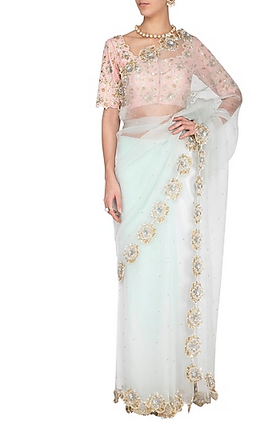 For the love of pastels we cannot help missing out this gorgeous saree! 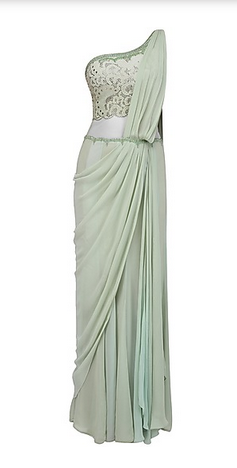 With its tailormade fit you won't have to do much to look graceful in it. Price: Rs 46,000. Buy it here. This fancy saree is embellished with jewels and girlish design. Look elegant and gorgeous by wearing this in your pre wedding functions or even at your ring ceremony. Price: Rs 13,273. Buy it here.